The historical State Capital Resolution passed by the German Bundestag on the 20 June 1991, came at a time of great expectations - also in Berlin. The wall had come down, the city had at long last been reunited and the Government was now going to come. There was a widespread spirit of optimism and a great future for the city appeared to be certain. There was the enormous increase in importance, which Berlin would experience as the new capital. An economic boom appeared to lie on the horizon, a large number of new jobs was calculated, amongst other things through the relocation of Parliament and Government. The preconditions for this were well met: there was sufficient land and buildings and financing through public funds was secure. It was clear that the Reichstag building alone could not meet the floor space requirements of the German Bundestag. The requirement for a working functionality was calculated to be 125,000 m² and for full functioning after all buildings had been finally completed, at least 185,000 m² would be necessary, plus an extra reserve of 29,000 m² floor space. 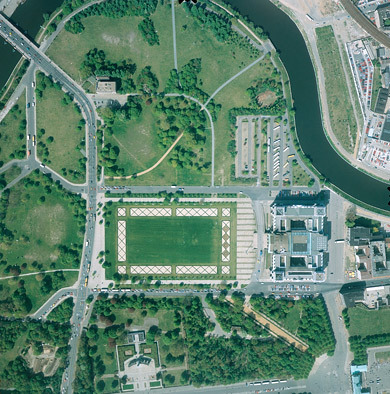 Therefore new buildings would have to be erected in the vicinity of the Reichstag, in order to realise a "parliament of short distances". In the initial euphoria the German Bundestag wanted to start to work in Berlin in 1994. However only one year after the State Capital Agreement had been signed, the parliament's Council of Elders ascertained that the four year deadline could not be met - the urban planning concept for the Spreebogen only being put forward in 1993. The plan to relocate within four years was over-ambitious and could only have been realised with an immediate decision to move into existing buildings. However, this was not seen by the Federal Government as being so until the beginning of 1995. On the contrary, each ministry wanted a clear improvement in its situation in Berlin. From the standpoint current in Bonn at the time, this only appeared to be possible through moving into new buildings. The planning process also took much longer than expected. Therefore the German Bundestag decided on the 10 March 1994, to move as quickly as possible to Berlin and at the latest in the year 2000. This milestone governed all further events.